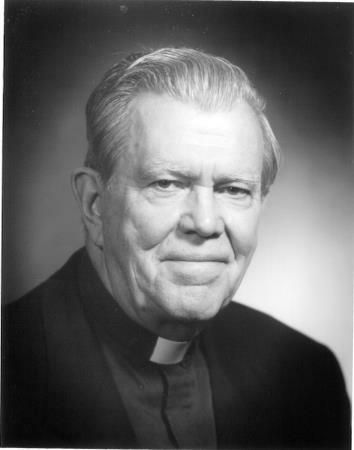 Father Louis Wolken died at St. Teresa’s Residence, Maryknoll New York on July 12, 2015. He was 96 years old and a Maryknoll priest for 69 years. Louis John Wolken was born in St. Louis, Missouri on July 2, 1919, son of Louis and Rose Mary Steffen Wolken. He had one sister, Marie, who died in 1956. Louis attended Cathedral Latin School (Junior Seminary for the diocese of St. Louis) and St. Louis Preparatory Seminary before entering Maryknoll in September 1938. He was ordained at Maryknoll, New York on June 9, 1946. Following ordination, Father Wolken was assigned to higher studies, returning to his native St. Louis to earn his B.S. degree in Physics. He served on the Venard faculty from 1947 to 1953, assuming the responsibilities of Second Consultor and Prefect of Studies in 1950. Father Wolken was assigned to the Maryknoll Mission Region in Japan in April 1953, and after language studies, he was named assistant pastor at Fushimi Parish in Kyoto. In 1955 he was appointed Consultor to the North Asia Society Superior, serving also as Acting Superior while the appointed Superior attended the General Chapter. In 1956 he was appointed Second Consultor and, in 1958 First Consultor. During that time he also served as Pastor of Sonobe Parish. Father Wolken returned to the United States in April 1959. He was appointed Vice-Rector and later Rector at the Venard. He also studied at the University of Scranton, receiving his M.A. in Secondary Education Administration in May 1964, at which time he was appointed Rector of the Chesterfield Seminary. In 1966 he was also appointed as Director of the Brothers Training Program at Chesterfield. He was transferred to Glen Ellyn in that capacity in 1968. In July 1971 Father Wolken was reassigned to Japan, serving as pastor of various parishes in the Kyoto Diocese, including Kinugasa, Uji, Otsu and Momoyama. In 1973 he was appointed Assistant to the Regional Superior. He continued in pastoral work until 2002, when he returned to the United States and took up residence at Mission St. Teresa’s. Father Wolken was assigned to the Senior Missioner Community in March 2004. For many years, he served as manager of the Business Office at St. Teresa’s, offering assistance to any residents who wished to have help in managing their personal accounts, check cashing, etc..
A Rosary and wake service was held at 4:00 p.m. on July 16, 2015 at St. Teresa’s. The body was received at the Maryknoll Society Center at 9:30 a.m. on July 17, 2015 with prayers in the Lady Chapel until 10:45 a.m. The biography was read by Rev. Richard Aylward. Mass of Christian Burial followed at 11:00 a.m. and was concelebrated in Queen of Apostles Chapel. Father Emile Dumas was Principal Celebrant and Father Robert Reiley was homilist. Burial followed in Maryknoll Society Cemetery with Father Thomas O’Brien conducting the graveside service.